For centuries, artists have been seduced by the beauty and grace of the flower. Floral motifs celebrate the vibrancy and natural splendour that exists alongside man, but the purpose of botanical imagery is often twofold. Beyond their aesthetic properties, flowers often communicate intangible themes of the human condition. 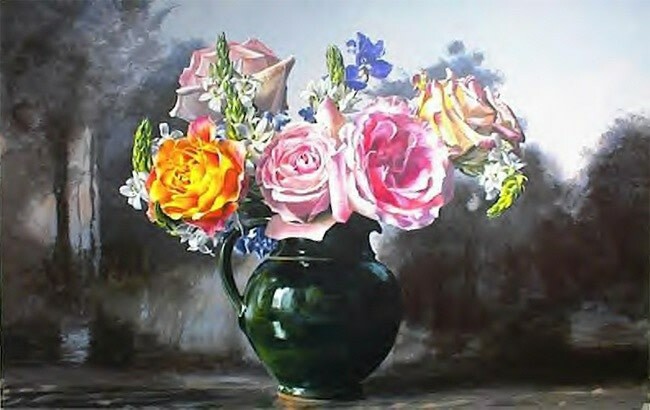 Floral symbolism varies depending on context and culture, but often serves as a reminder of the transient nature of life. Much like the symbolism of fruit in art, a flower that is healthy, colourful and in full bloom signifies youth and fertility, while a wilted flower reminds us of the inevitably of death. Flowers have also been used as representations of natural processes, particularly themes related to reproduction and death, and of moral characteristics such as innocence and virtue. In Western culture, different species of flora have come to symbolise different things. For instance, the rose is a strong symbol of love, daisies represent youthful innocence, lilies are a sign of purity and sunflowers signal devotion. 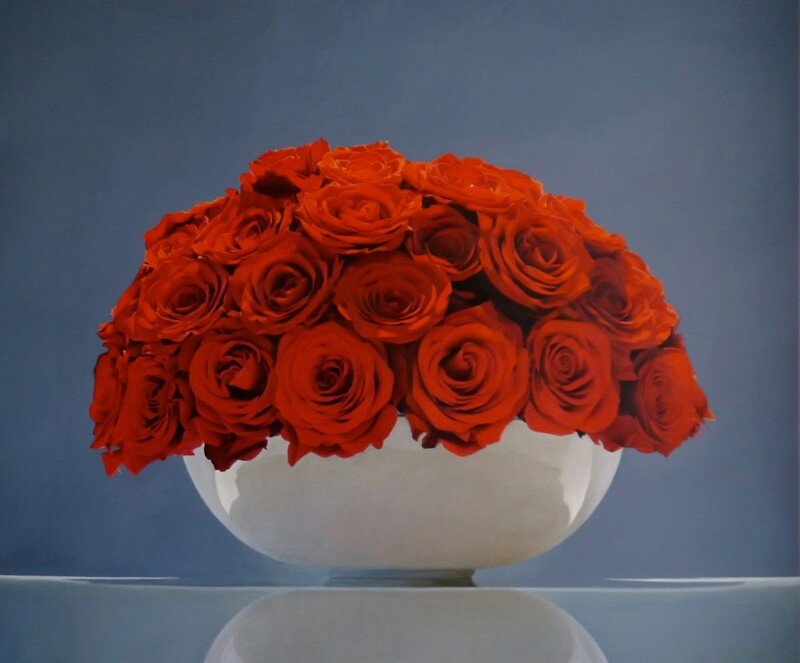 Ever since the still life painting proliferated in the 16th century, artists have used flowers as subjects to breath colour into their compositions and communicate subtle messages about the human condition. 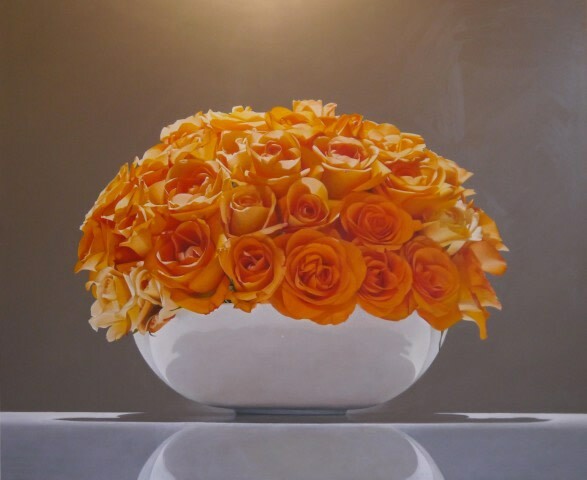 However, hyperrealists who are refreshing the still life genre with contemporary methods of painting, endeavour to invigorate the painting of flowers by challenging notions of tradition. 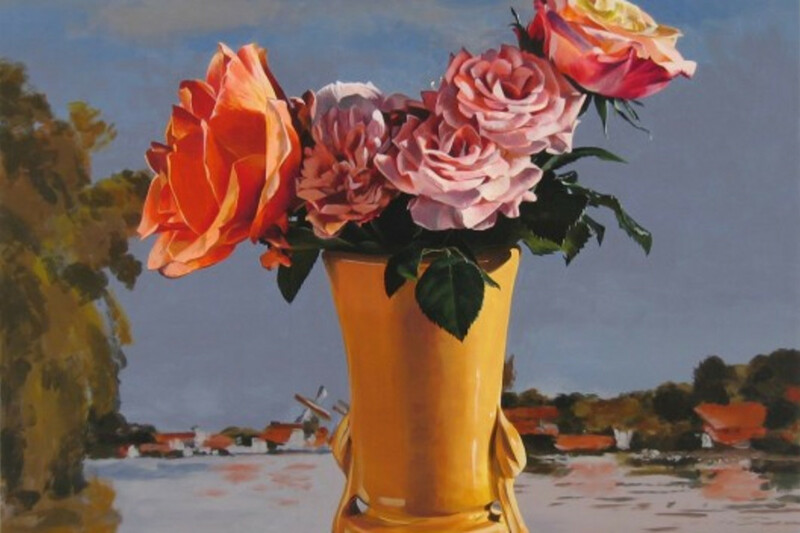 A pioneer of the American Photorealist movement of the 1970s, Ben Schonzeit creates evocative floral hyper realistic still life paintings that are abstract in conception and have a distinct surrealist edge. 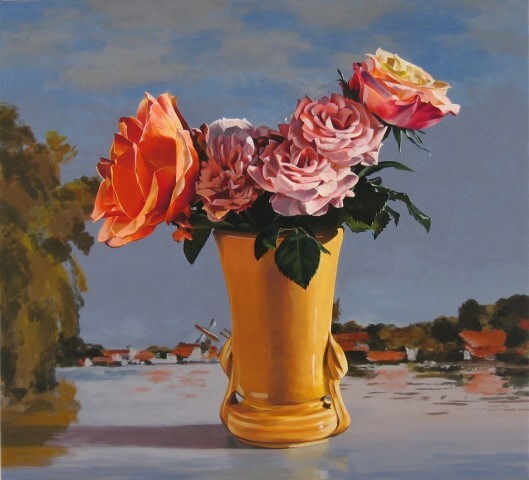 Schonzeit arranges flowers, photographs them and then paints his subjects on large, arresting canvases that explore the artist’s dream world. Lush, bold and vibrant, these compositions become technicolor masterpieces. Schonzeit has also played with our senses by exploring the way we see things. 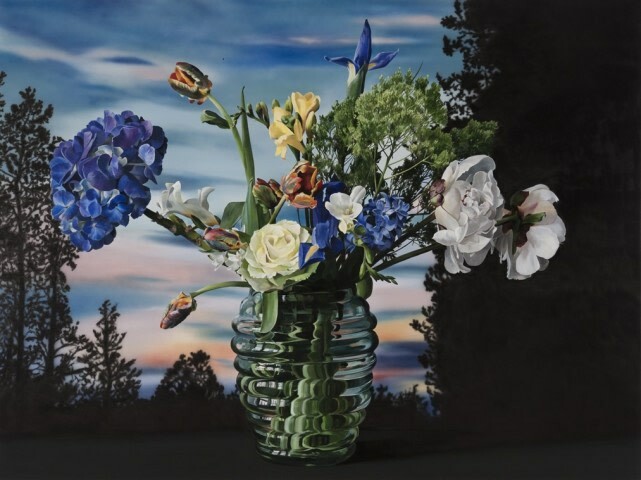 In a series of paintings, he challenges the viewer’s perception by depicting blurred visions of flower bouquets, a stark contrast to his high focus floral paintings. During his four decades as an artist, Schonzeit has explored and experimented with numerous techniques and mediums, and has exhibited in over one hundred exhibitions and shows. His work can be found in the permanent collections of major museums around the world and many original paintings can be viewed at Plus One Gallery, his UK representation. Usually with still life paintings, you know what you are going to paint, but with me – I just start painting with a colour and a vague idea. It’s all about taking inert material and making it come to life. My best work has some sort of vitality, that’s why I don’t consider my works to be strictly still life. 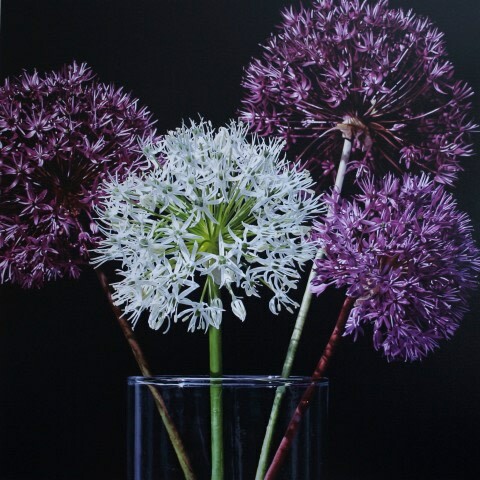 Canadian visual artist Glen Semple celebrates the beauty of ‘the everyday’ with photorealistic floral paintings suffused with colour. His vibrant compositions seem to transcend the boundaries of our observation, a result of his intricate focus on hidden detail often unnoticed by the naked eye. I get pleasure from creating a realist image while exploring the subtle variations in colour, light, value, and textures that create the illusion of depth. I might take up to 100 pictures with my digital camera, then use photoshop to piece together an image from all the elements I like. I’d be a photographer if I could take a good photo. It’s much easier pulling together the good parts of a bunch of photos in a painting. The rose has been treasured throughout history more than any other flower. Symbolic associations have existed since the days of the Ancient Egypt where the rose was sacred to a number of goddesses including Isis. It was also symbolic in Ancient Greece and Rome, where it was identified with the goddesses of love, Aphrodite and Venus. Sarah Sibley focuses her attention on roses. Compelled by her pursuit to recreate reality, Sibley works obsessively to find balance in light and colour in a quest to create the illusion of perfection. Sibley demonstrates our unwavering appreciation of the flower, creating monumental renditions of traditional roses that highlight the sheer beauty of nature.